WhiteCloud Software Ltd. announced the announce the release of version 3.5 of EAComposer. An innovative and simple-to-use enterprise architecture tool used it to manage your IT landscape and technology portfolio. Delivered as a pure SaaS product: cloud hosted with a subscription based license model. This release added reporting & analysis functionality to our product. These new features allow you to quickly, without any SQL knowledge, create simple but very effective reports and insights. The report is presented in a MS Excel like format which you can then tailor e.g. apply highlighting, add comments etc. The report can also be downloaded as an MS Excel document. We were able to find a nice blend of easy-to-use reporting with great flexibility to tailor the report results using a well-known MS Excel like interface. Provides insight into which architecture components are impacted by a specific component. E.g. 'which components are impacted by application XYZ'. Probably one of the most common EA reporting needs. Almost the opposite of an impact analysis report, this report type is useful for questions like 'how is this capability supported'. Validation reports provide insight on data quality aspects of your architecture repository but the usage stretches beyond data quality reporting. Used to answers questions like 'show me all applications that don't have a vendor assigned'. A Catalog is one of the core TOGAF artifacts and provides an inventory-like list for a selected component type. Often used to maintain a list of standards e.g. a list of standard applications. 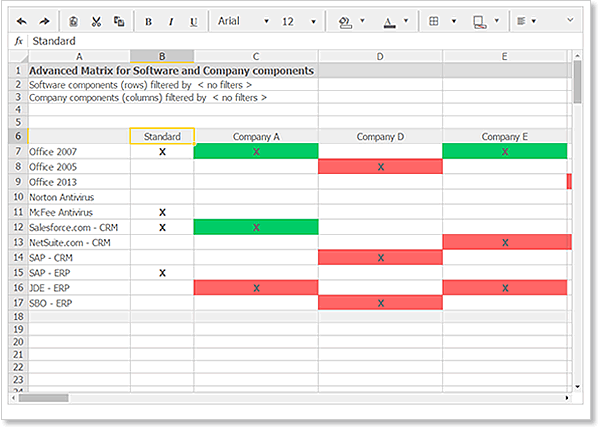 Last but not least are TOGAF Matrix reports which, create a matrix view for two types of components and see they connect. A very common example is an Application-Organization matrix which will show your applications (rows) and your business units(columns) and would mark which applications are used by which business units. The reporting & analysis feature also includes a complete video tutorial. Click here to access the new reporting & analysis feature.